It's December and Linderhof is decked out for Christmas!!!! 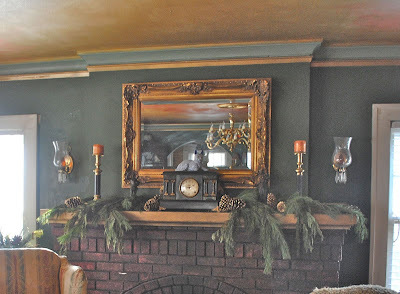 From the living room tree to the master bedroom mantle touches of Christmas abound. Our "masterpiece" is the tree -- a labor of love by Husband Jim for it does take a full day to decorate our floor to ceiling tree! With big old fashioned colored lights, 41 years of Christmas ornaments, some so old that they only shine from memory and tinsel!!! It touches the ceiling and we wouldn't have it any other way! 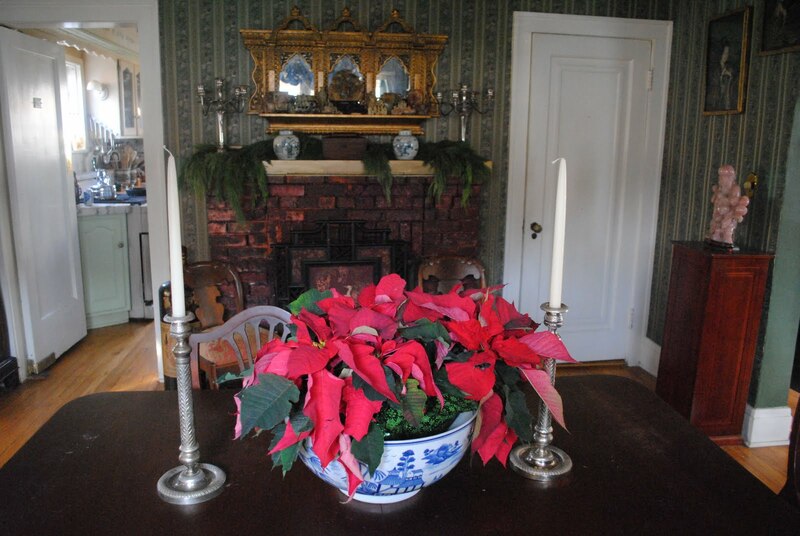 The downstairs hall with an Asian bowl holding a poinsettia -- a bit of Christmas color. The nativity set which belonged to my grandmother and it was a favorite "toy" when I was a child -- which explains why when I received it one wiseman was missing, the dog's nose was broken, the donkey had no ears and Joseph had lost his staff! I replaced the missing wiseman, added some sheep and shepherds and a camel. But I like the imperfections in the pieces that were hers and so our dog has no nose, the donkey is earless and Joseph is missing his staff. This nativity absolutely glows -- with sentiment! 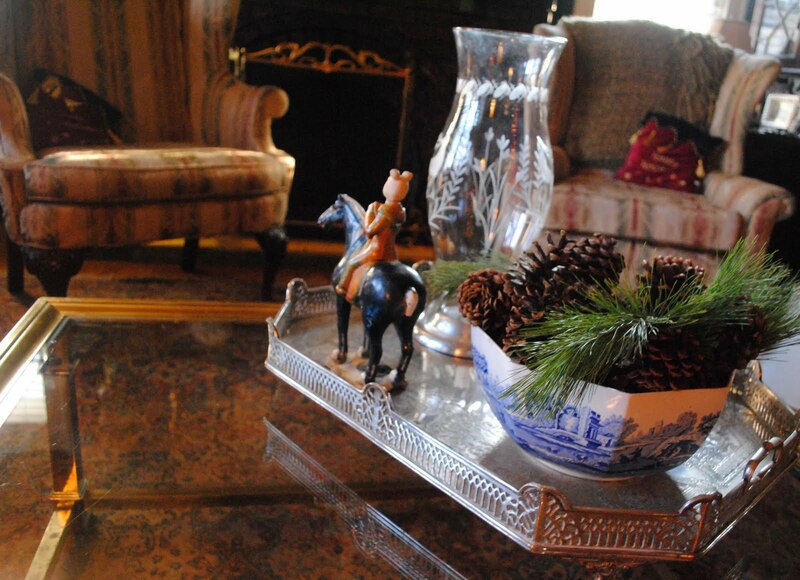 The living room mantle with fresh greens and a few pinecones. 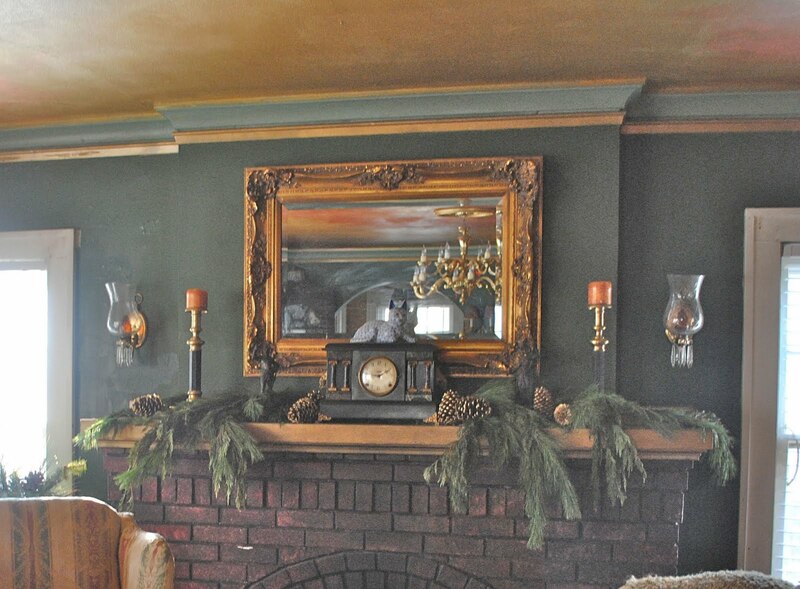 The green of the evergreens goes well with the green of the living room. A game table in front of the windows with a cloisonne vase with pine branches and cones. 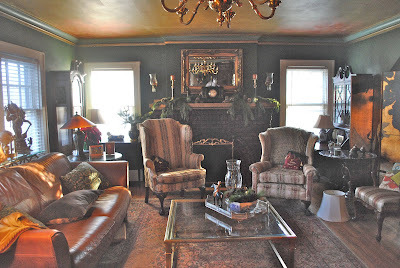 The living room is ready for Christmas -- and for company!!!! We're planning to entertain a lot this Christmas! The blue Asian bowl on the dining room table full of poinsettias. A strong blast of red! 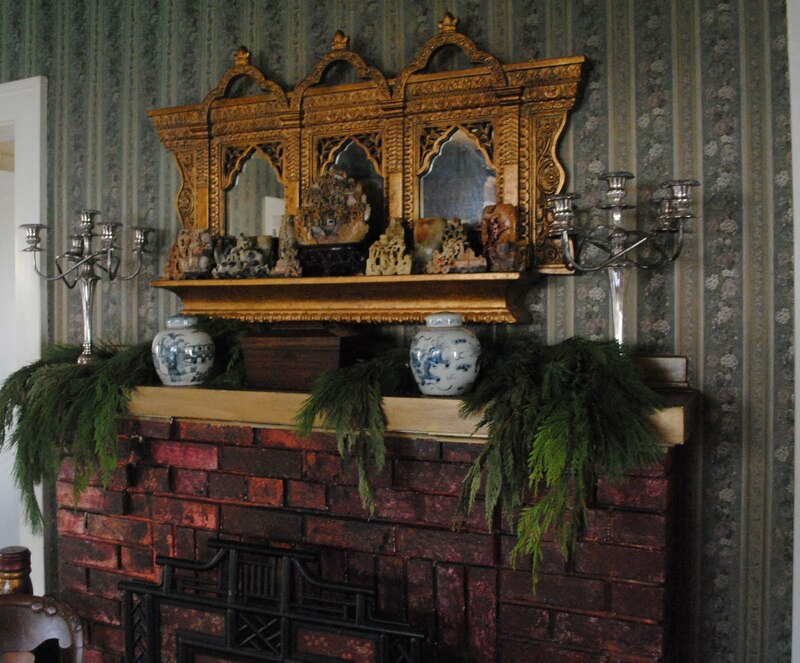 And the dining room mantle has more real greens -- this time without pine cones. The dining room table and the fireplace. 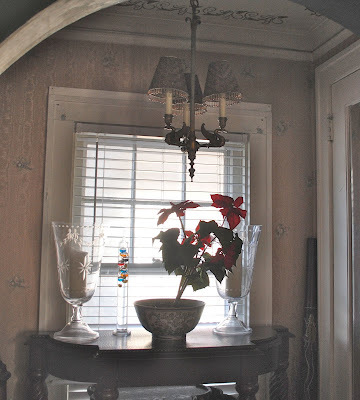 The table at the top of the stairs -- a vase holding some "faux" (and I must admit that there isn't much "faux" Christmas at Linderhof) -- some mistletoe stalks and some red berried stalks. More real greens on the bedroom mantle. 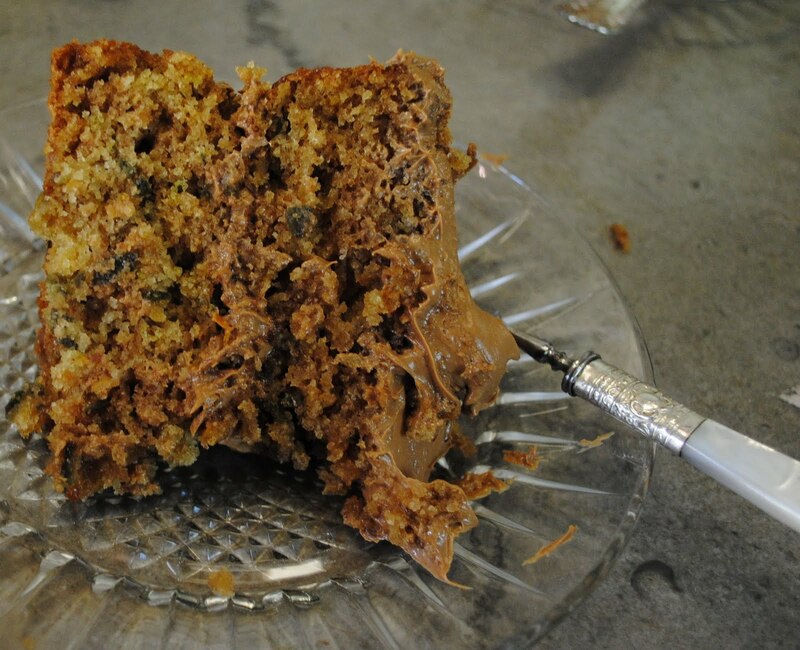 Martha it's beautiful!!! The tree is fantastic! And I love the fresh greens and flowers everywhere. I'm so glad you kept the dog with no nose... a new nativity would not have the same memories attached to it. Here's a toast to your beautiful holiday decorations. I love your gorgeous tree! What a beautiful labor of love and the whole house just looks amazing! Your home is beautiful and magical year round. Thank you for the Christmas tour! Beautiful! I love the lushness of the Christmas tree and the simplicity of the mantles--a perfect combination. The pop of red poinsettias throughout is such a nice touch. 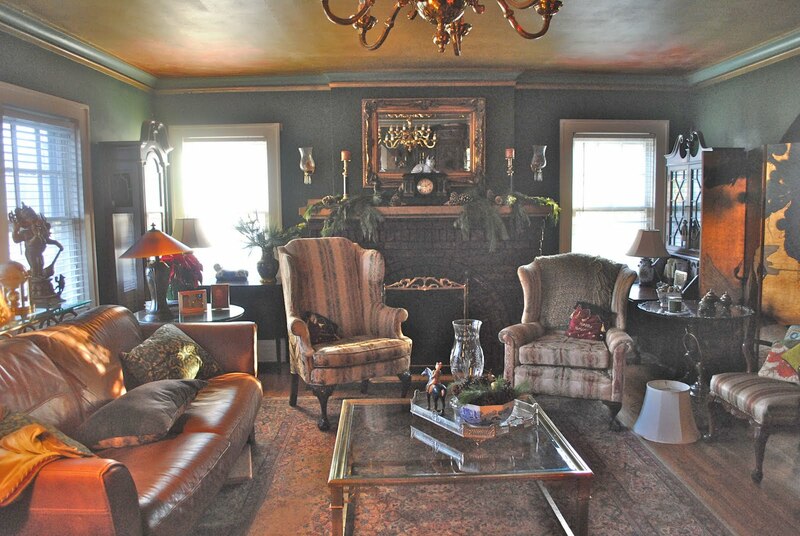 I'd love to sit by the living room fireplace and have a cup of tea with you!! So lovely! Very festive! LOVE the tree! Lovely! 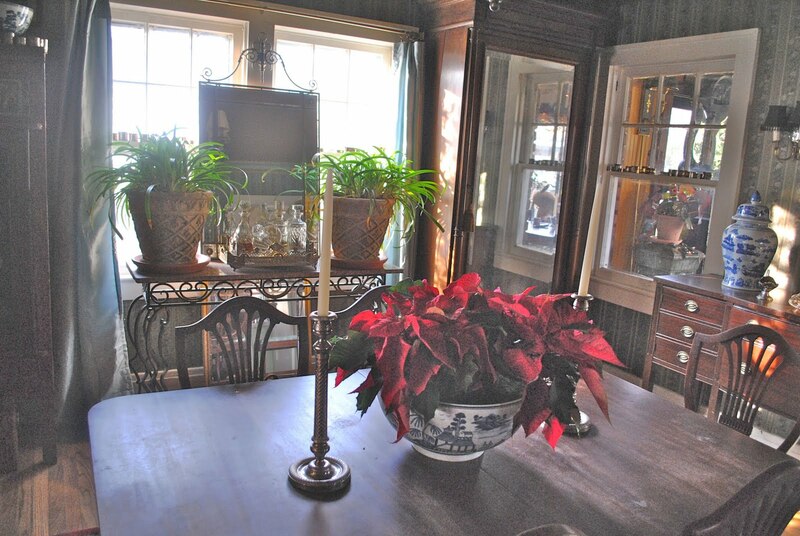 Fresh greens give the house a scent that can't be matched by any perfumed potpourri! Your tree is truly a labor of love from hubby, Jim. What a special gift that he gives to you each year! I love that you've left the imperfections on the Nativity set. Grandmother wanted you to know the true meaning of Christmas. . .what better way than to let you play and aquire the set. I know it is priceless! Thank you for inviting us in to Linderhof at Christmas. Martha......so festive. Everything looks beautiful and perfect. Your home must look amazing at this time of year....thanks for the tour. I love your house dressed for Christmas! Martha, do you have a new camera or is the improved light resulting in those great photos? Love the tree and your use of fresh greenery. Wow, beautifully done! Love those pieces! Thanks for sharing, Martha. That tree is amazing! you decorated your house fantastic. 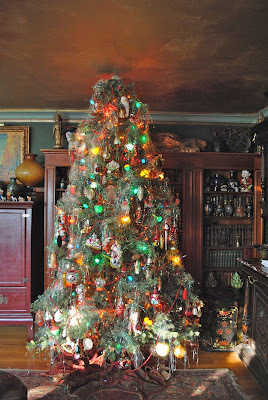 What a wonderul Christmas tree and all the rooms are so nicely adorned. I really love your nativity scene. That is how it should be, a truly loved heritage. Hi Martha! WOW - your home is delicious - a real feast for the eyes. The tree truly is your "masterpiece". Thanks for stopping by my blog and leaving such a nice comment. Merry Christmas! Your house is lovely. 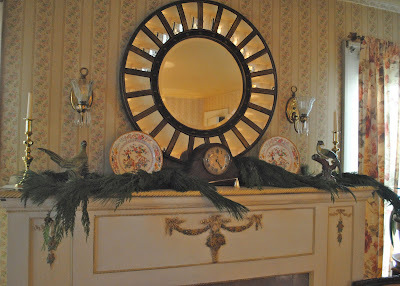 I love all the branches on the mantels. That is probably my fav way to decorate. Your nativity story is priceless and real and thanks soo much for sharing. thanks for dropping by with your sweet comments. I always enjoy seeing Linderhof all decked out for Christmas. All of your photos would look great on a Christmas card. I am still working on my Christmas decorating but hope to have some pics soon on my blog. I adore the Christmas tree with all of the decorations and tinsel too!!!!!!! Such a beautiful tree in an absolutely gorgeous home. Linderhof shines, as usual, at Christmas. What a beautiful place you live in! Just beautiful1 I love your living room and all it'd decorations. Your tree is magnificent, no doubt about it. Your husband had done an incredible job with it. Martha, the tree is absolutely beautiful! 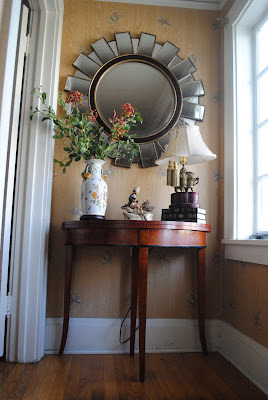 I love the coziness of the livingroom, too! 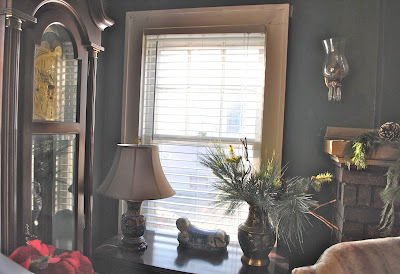 (Especially love all the light coming in the windows!) Thank you for the Christmas tour! Martha, everything is so festive, elegant and picture perfect. I hope you be joining our favorite holiday movie theme for Pink Saturday this week. Your home is so beautiful - perfect for Christmas! Martha, Everything is so beautiful. I know you have been enjoying it every day. I think I just realized my time management problem. You get the decorating done early, then you can enjoy visiting everyone else. By the time I got finished everyone else was sick of looking at Christmas Decor.